Highland Homes, home-grown in the state of Texas, has been catering to the Lone Star state’s craving for innovative home designs since 1985. This employee-owned company built from the ground has been going strong for 30 years. And, that’s because of the combined talents of founders Rod Sanders and Jean Ann Brock. Over the years, this brother and sister team’s creative approach to keen business practices and sales and marketing has helped the company continue to strive and grow. In addition to winning countless awards, Highland Homes also continues to win over prospective homebuyers. Why? Because their homes are beautiful. And, it shows. Expert craftsmanship and a high level of quality goes into every home. You’ll fall in love with their unique architectural designs, open concept floor plans, luxurious master bedroom suites, and options. And, that’s because they use extensive lifestyle research and customer service to identify the newest in lifestyle trends. It also helps them to ensure their designs are forever evolving and up-to-date. They also use the latest in energy-efficient construction materials and methods to build comfortable, eco-friendly homes. As a result, homebuyers can expect more efficient systems with lower energy bills. What sets Highland apart from other home builders is their commitment to customer service and professionalism. According to their website, the company’s strong foundation of core values and guiding principles focus on always doing the right thing. Their customer service guarantee is built in to every stage of the building process. And, that translates into happy customers, partners, and employees. It’s also easy to understand why Highland consistently comes up on top in customer approval ratings. When looking for a new home remember it’s all about the location. As a result, Highland Homes carefully selects locations and master-planned communities that complement the lifestyles of their home buyers. And, the community of Travisso in Leander is no exception. In Travisso Highland Homes offers 13 single-family one and two story homes in a multitude of collections, elevations, and floor plans with square footage starting at 1,900 to over 3,000 square feet. Or, if you’re ready to move in now, view this list of currently available homes. 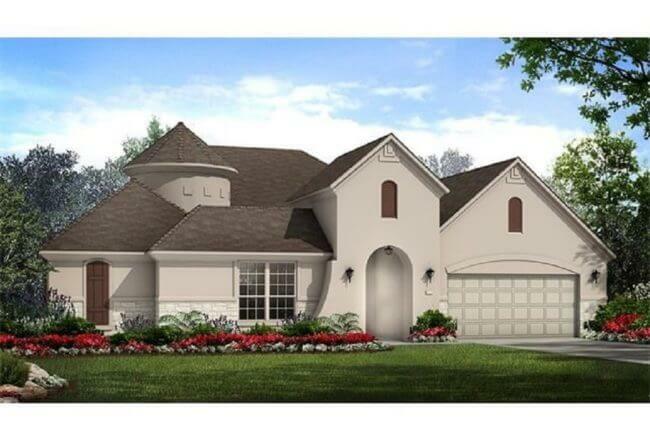 To realize your very own American dream come true visit Highland Homes in Travisso today. You’ll discover breathtaking views, natural scenery, and outstanding amenities. We are located near northwest Austin’s high tech employment center, within the acclaimed Leander school district, and 30 minutes from Downtown. For information call 512-243-8583.